I couldn’t find any further information on that, especially since most reviews have been done by road cyclists. 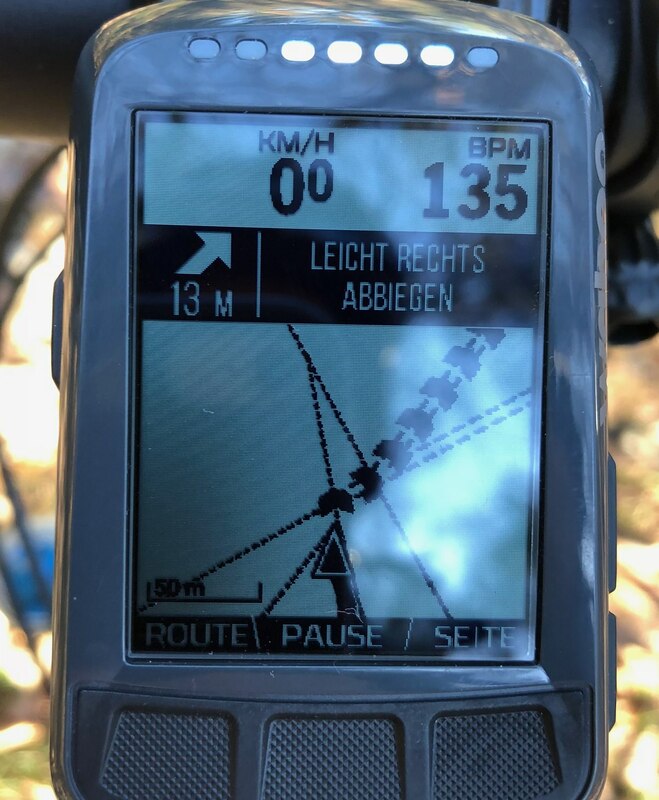 Note regarding the image: This doesn’t show an ELEMNT BOLT, but an ELEMNT – which has a bit larger display. The onscreen arrangement and resolution is similar. An intersection of 4 different paths. Really hard to know where to go! 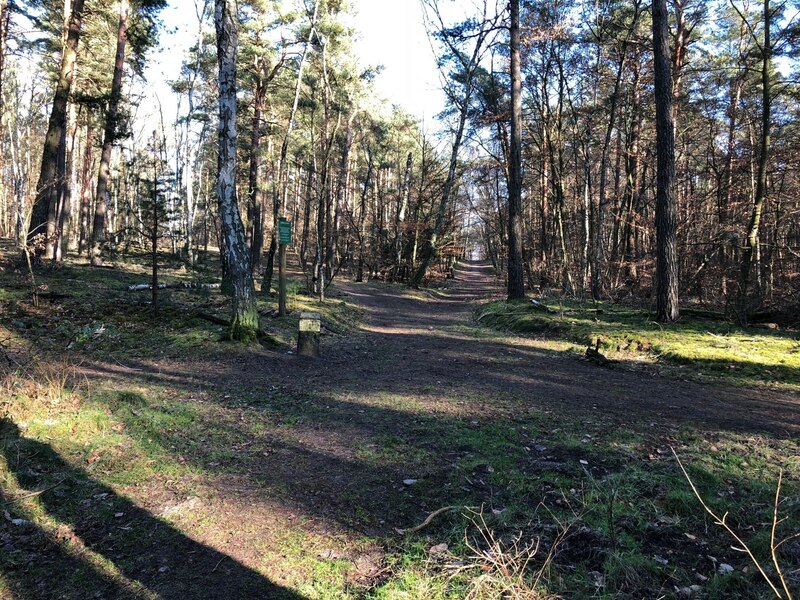 When riding a mountain bike in the woods, in contrast to riding on the street, navigation and orientation are a bit difficult. 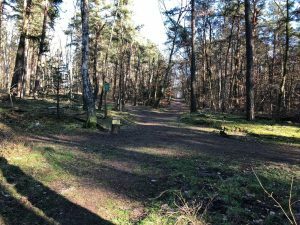 After all, there are not a lot of signs in the woods (apart from hiking path signage), and many paths are so small that they can be easily overlooked. This is especially the case when riding single trails. And often the speed is quite high, which means you don’t have time to orient yourself. The same intersection from above as seen in the map view on the BOLT. It’s very clear where to go. You need to be able to choose a route you want to go and store it on the device. The device must be able to constantly display a map with position and direction. The map needs to be very detailed, because you often ride tiny paths with an MTB. The device needs to react quickly to changes in position and direction. Turn-by-turn directions should be possible, they need to be clear and impossible to miss (e. g. when going at high speed with wind noise). It must be water and shock resistant. It must be able to survive a bike crash. Using it with gloves must be possible. With none of these devices did I have a lot of fun riding my MTB. The route can be stored on the BOLT very easily using the perfect smartphone integration. This can be done without any configuration effort, anytime, and (only) wirelessly, even on the go. To be more precise, you use the Wahoo app’s integration with different cycling / outdoor services. 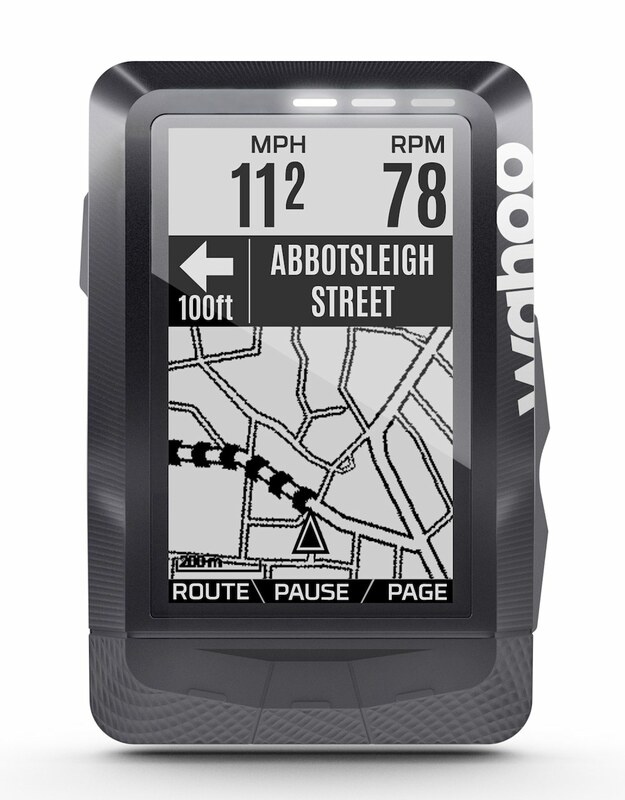 Currently supported are for routes with turn directions: Komoot and RideWithGPS, plus the Wahoo ELEMNT app itself. 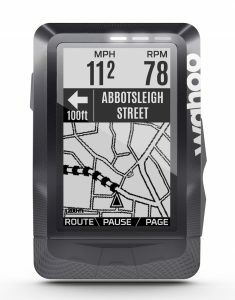 Example: You plan the route with Komoot, which then automatically appears in the Wahoo ELEMENT app and can be sent to the ELEMNT BOLT via bluetooth. Side remark: The smartphone can stay at home. The BOLT works autonomously, once the correct route has been loaded. The ELEMNT BOLT by default comes with a display page configuration “map” which also displays the speed. Any other further data fields can be easily added to it. With more than 2 data fields the maps display starts to become too small to be useful though. A key press leads to all other display pages (which are also freely configurable). Some word regarding the map display quality: The ELEMNT BOLT has a black/white LCD display (resolution 320×240) with illumination, which is only needed in the dark or dusk. I was a bit skeptical first, because I’m a bit spoiled by all the very good smartphone displays. The BOLT’s display is totally sufficient for navigating using the map from my experience. The route and paths can easily be recognized and distinguished. A realistic impression of the map’s resolution can be seen in the image in the first paragraph of this page. Wahoo uses OpenStreetMaps as it’s map base material. These OSM maps can be very detailed. In the Berlin area for example, every tiny path can be found in the map – in other regions this can of course be different. Wahoo also updates the map material regularly, the updates can be very simply downloaded to the device. Maps are provided for all of the world’s regions. 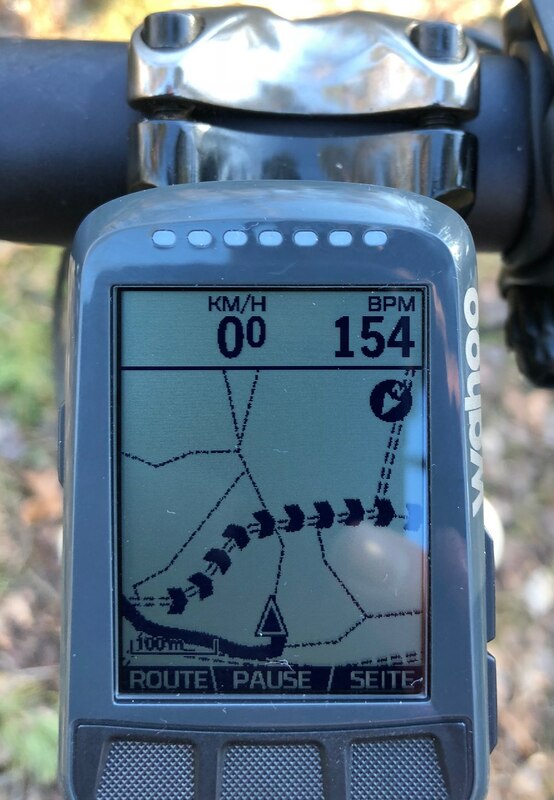 The ELEMNT BOLT supports GPS, GLONASS, and Galileo (and some more) and the speed and accuracy of positioning is absolutely sufficient for a fast-paced ride through the woods. I need to say that I wasn’t able to test this in very deep valleys (where sattelite connection may be worse). If you ride a specific track, the map displays the surrounding paths. The path you need to ride is clearly indicated. If you get closer to a turning point, the distance to it is displayed. From a certain distance on, a popup is displayed and there is an acoustic signal, and also one from the integrated LEDs. Additionally, the LCD display’s illumination turns on for a short period. If you miss a turning point or get off the track, the BOLT also clearly indicates that with a different acoustic signal and a different LED color (red) for a couple of times. After about 10 seconds, this stops, so you can also keep on riding off the planned track without being bothered by constant alerts. This can be seen in the image on the right. After getting off the track, if you get back on track at any place of the route, the ELEMNT BOLT reacts just as you would expect – it quickly recognizes that you’re back on track, and continues with guiding you on the track. Also, you can start a route anywhere – you don’t have to pass the route’s starting point. As soon as the BOLT recognizes that you’re on the track, it turns on the routing. Overall, the turn-by-turn directions and routing are very clear and can’t be overlooked. According to different reviews and also from my own experience, the BOLT gets to at least 10 h on a single charge, with active routing, some illumination, LEDs and at temperatures around freezing point. When turning off some of the features, e. g. illumination or routing, you can probably get to the advertised 15 h, even at that low temperature (batteries last much longer when it is not that cold). So the BOLT seems to squash all competing devices with similar functionality. As expected, the BOLT is small (so it’s protected by the stem and handlebar a bit) and light, and of course, sufficiently water resistant. I didn’t do any crash testing, but it sure looks quite robust. The mount also resists any strong shocks and vibrations which are common during mountain biking. Those physical properties make it much better suited for outdoor sports activities than e. g. a smartphone mounted to your handlebar. The BOLT doesn’t have a touch screen, but physical buttons on both sides and at the bottom edge of the display. They can be used just fine even with winter gloves. These buttons also offer good usability when the device is wet. With touchscreen devices, one often hears reports about input problems when they are wet (e. g. with some Garmin devices). The Wahoo ELEMNT BOLT is well suited for mountain biking, especially riding single trails. Hi, thanks for all the good info here. I have a similar list of requirements to what you’ve listed. I’d like to draw a route on a smartphone and upload the gpx to a device via BT. For route planning I’m using CartographPro on iOS. I can then export the gpx via “Open In…” menu to other apps. Any idea whether ELMNT app would support such an input? Does it appear in the Open In menu? I think this will work. I tried the following: I created a GPX file (on my laptop) and sent it to my iPhone via AirDrop. The iPhone automatically offered the Wahoo ELMNT app to open it. I then stored it in the Files app, and Files also offered to open the file with the ELEMNT app. Unfortunately I wasn’t able to test it with the CartographPro app because it’s not offered in the German app store. Many thanks indeed! Sounds like Bolt is the way to go. BTW, for some reason on the AppStore the app is called “Cartograph 2 Maps” but it shows app as CartographerPro once installed. It’s from an Austrian guy (https://www.cartograph.eu). Thank you very much for the post. I have the same requirements and this was the only place where I could find good information whether Wahoo is well usable for mountain bike navigation. Regarding 1., I’d add it’s also easy to use a route created on your own computer. Some part of Wahoo storage can be mounted using MTP and gpx routes can be simply put there under routes/ subdirectory. Turn-by-turn directions work with BRouter when using Locus style directions, although Wahoo converts fine directions to just one of the three “left”, “right”, “straight” (which is still better than with RideWithGPS where everything is apparently just “straight” and real instructions are just in comments). Comments can be added using gpx element, which I think can be very useful to not miss important waypoints. I’ve been looking for a mtb review for the element bolt for ages! Any experience with Garmin edge 130? What would you advise? Bolt or edge 130? 3. Create my own cues. Add points for the peaks, the dangerous downhills, any water for the long routes. I also love to add points for 1/4, half and 3/4 for the long climbs. 4. Take note where the path splits. Then add cue turn points. 6. To confirm your track, you can load it in any site and check that it is loaded correctly. If happy, send the file to your phone and import it in Wahoo Companion App, then send it to the device. The breadcrumbs are easy to follow, the Wahoo is much easier to zoom in/zoom out than Garmins and the default OSM maps are detailed enough. You can also add important metrics to the map screen and ride using this as your main screen. I tend to switch to the climbing/elevation screen when doing long climbs, when I know the route but I need to know how long till the top. The main issue with the bolt is for the descends and fast flowy singletracks in the woods. The Bolt loses GPS accuracy with fast movement, but the leeway off the track is very tight. As a result you get CONSTANT beeps from the bolt. Two notifications that you lost the track, followed by two notifications that you are back on track. And this repeats at least every minute! Even if you are following a track you recorded with the same unit! In order not to get crazy but keep the useful notifications otherwise, I just draw the route way off the track. I get an instant notification I’m off, and then I can ride without it interfering, until the fast track is off where I draw again on track.